San Francisco-based manufacturer WaterField may have set the new standard for quality Nintendo Switch cases. If we're honest with ourselves, there's very little reason to buy a case for a traditional home console: players just don't move them around enough to warrant such a purchase. That's obviously not true for the Nintendo Switch, though, considering the system's focus on working both at home and on-the-go. This means that many players have opted to buy a travel case for their Switch system, and toward that notion, there are loads of great Nintendo Switch carrying cases on the market. With that said, it seems the latest case from WaterField Designs, called the Nintendo Switch Arcade Case, might be the new de-facto standard for portability and durability. 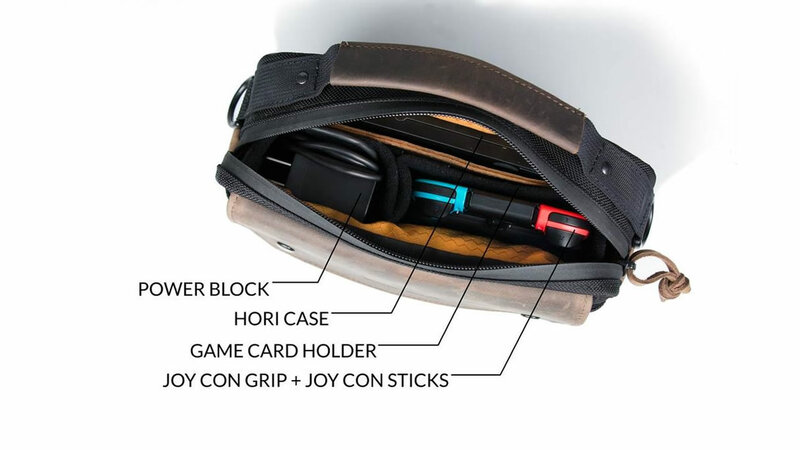 The WaterField Arcade Case for Nintendo Switch is a premium offering, meaning it comes with all the top-tier features that players hope for but generally don't expect, like construction materials pairing full-grain leather and waterproof YKK zippers to either durable ballistic nylon or tan waxed canvas. The case is designed similarly to classic messenger bags, with a leather flap covering a soft padded pocket for the Switch system up front and enough room in the main compartment for the Joy-Con grip, an AC adapter, and even the Hori PlayStand dock. Even with all of those accessories in tow, players will also still have room for a pair of earbuds, an extra USB-C cable, and even WaterField's own leather-constructed Nintendo Switch Game Card Holder. Even better, players who like to game with the Nintendo Switch Pro Controller will be able to fit it inside the Arcade Case with room to spare. Considering the case's deceivingly-commodious size, it might even be possible to carry the Pro Controller and the Switch AC adapter plus several accessories all at once. As might be expected, this sort of quality, consideration, and craftsmanship doesn't come cheap — the WaterField Arcade Case for Nintendo Switch currently runs for $109, which is four times the cost of our next-favorite case, the officially-licensed RDS Industries Nintendo Switch Game Traveler. Still, for those players who want a Switch case with extra durability and added style, WaterField's latest offering can be considered the best of the best. Interested buyers can check out more of the case's features in the video below, and the case can be purchased through the official WaterField website. It's not a man purse, it's called a satchel. Indiana Jones wears one. I've had it since, like, March. It travels very well and has enough room in the front pocket for a cable and some other small things. Good stuff. Yup. I am using their kindle case and I bought it with 1st gen kindle. I had a wallet of theirs but lost it or gave it away.